I have a class that is all about doing HTTP requests, and logging (in file system & database). It's only using 3 dependencies to do these things, so I'm fine with the code so far. Now I'd like to write tests for this class. It seems I can't do anything else but mock, mock, and mock even more. This looks really smelly to me, because I feel like I'm only describing the inners of the class, so instead of describing what the class should do, I describe how it does what it does (which should be of no interest, right ?). Is that common to have so many mocks (basically almost only mocks) to test a class ? Is that a good practice ? If not, how can I change this ? First of all, Bravo for writing unit tests! Secondly, Bravo for doing it in PHP! Seriously though, I don't see enough people doing this type of testing. What you're running into is referred to as test pain. Test Pain describes the amount of effort and setup required to sufficiently isolate code dependencies in order to perform unit testing. In your case, the problem is the HttpRequest class. 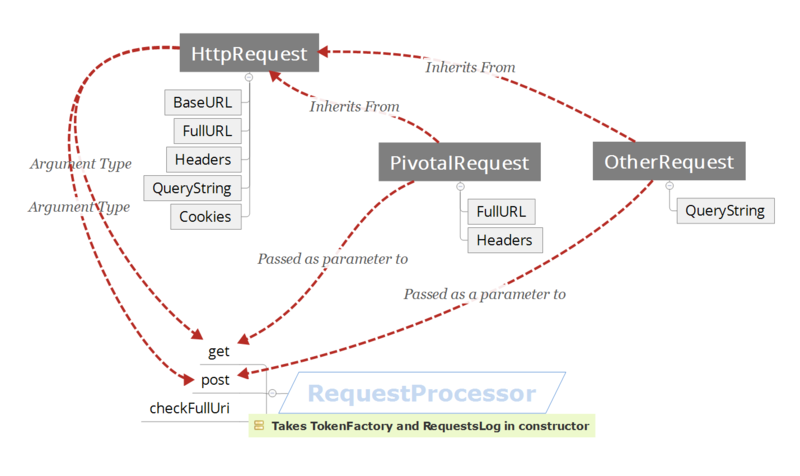 The class has a deep object graph that your PivotalRequest class knows too many details about. One approach here would be to create some helper code in your Unit tests that can easily create default values for mocked HTTP data (like request, cookies, query string, etc...) to help reduce test pain when dealing with HttpRequest. The reason you have almost ONLY mocks as you said, is because your class is actually pretty compact and simple (which are both good). It is only the sheer size of mocking an HTTP Request compared to the amount of your actual code that makes it look this way. By being that explicit, it becomes clear that you are really only interested in input and output and what happens in-between is less important (unless the test is focused on what is in-between). If the HttpRequest class is too complicated, it could be that the code smell here is that class does too much and should be split / broken down into smaller chunks. Then, use the CompactHttpRequest class in the constructor of your PivotalRequest class instead of HttpRequest. In doing so, you'll only ever need to mock one method. In addition, the only aspect of that mock that you care about is that the setHttpRequestDefaults method is called. The specifics of what is passed becomes irrelevant for the purposes of the test. In this test, the actual content of the headers being set seems like extra data that isn't necessary to specify if we're not ACTUALLY going to make the HTTP request. This being my preferred approach as I believe it is more in the spirit of OO programming. In this way, your system becomes more flexible and all of your core logic is in one spot in the RequestProcessor class. Overall, the best way to know what will work for your application and what won't is to decide what type of testing you will do. I am more of a mockist tester as defined by Martin Fowler, so I am interested in having slightly stronger coupling between my tests and my implementation because it forces me to think more about what I'm doing and although it makes tests a bit more fragile, it also finds more bugs. Not the answer you're looking for? Browse other questions tagged php unit-testing json mocks phpunit or ask your own question.